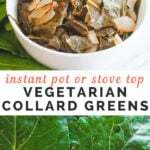 You can make this savory vegan collard greens recipe in half the time in your Instant Pot, or make these nutritious greens the traditional way on your stove top. Collard greens, more often called just “collards”, are a Southern staple. They’re traditionally made with salt pork or ham hock, but that won’t stop this vegetarian soul from enjoying her flavorful greens the vegetarian way! But hang on. We’ll get to that. One of the dishes I find myself missing most often at restaurants is collard greens; they’re so good, but so not vegetarian! So, I figured it was time to make collards with a vegetarian twist, giving the leafy green its chance to shine minus the meat. Don’t forget about the diced onion and minced garlic sauted in olive oil until aromatic. Mmm flavor! 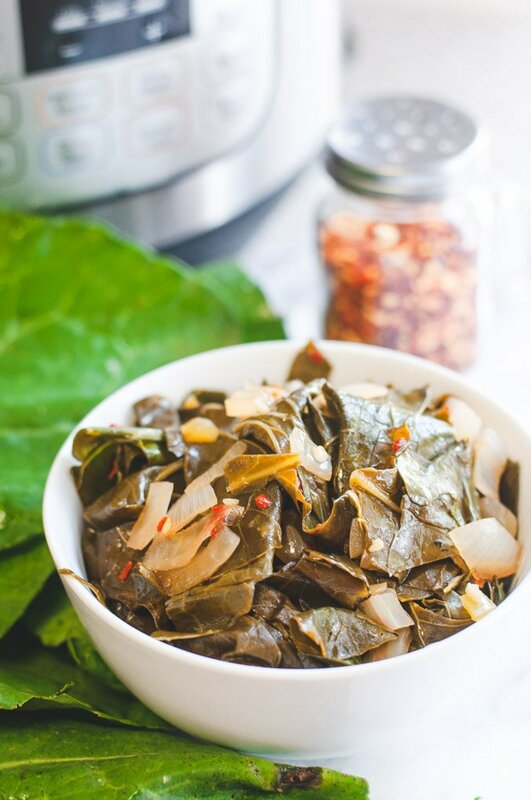 Making collards in an electric pressure cooker cuts the cook time by half and you end up with the same soft, wilty texture as stove top collards. First, you’ll want to set your Instant Pot to “saute” and “normal” heat and saute diced onion in oil for 3-4 minutes, until translucent. Add minced garlic and crushed red pepper and cook for another minute. Add in the liquids and collard greens, roughly cut into 2-3 inch pieces and their hard stems removed. Set to high pressure for 25 minutes; once the time is up, manually release the pressure. Careful! There will be a bit of liquid spray form the valve. If you find the collards aren’t as tender as you wish, just place the lid back on and set the timer for 5 more minutes. Collards are members of the cabbage family, but they’re also closely related to kale. Collard greens are rich with vitamins A and K, and are also a source of iron, folate, and calcium. 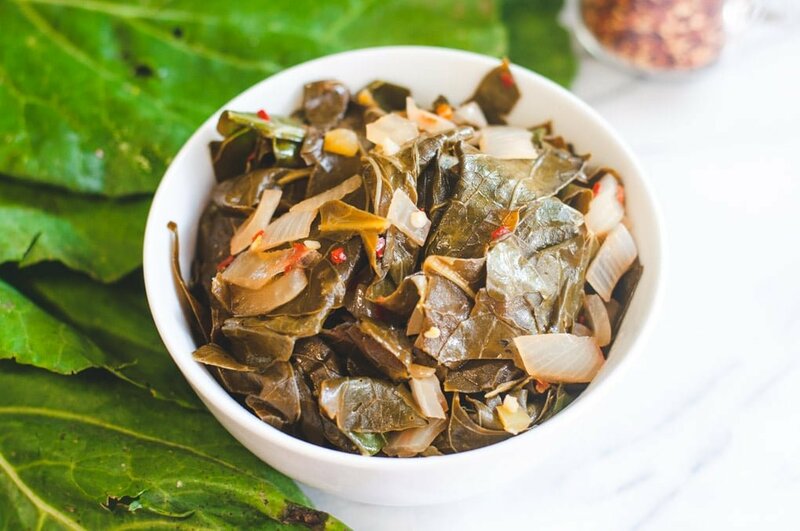 Because these vitamins and minerals can seep out of the greens during their long cooking process, you’ll want to enjoy your collards with the liquid they’re cooked in, also known as pot-likker. Pot-likker (also called pot liquor) is the broth, or liquid, that results from the cooked down greens. It’s vitamin rich and wonderfully delicious, taking on the flavor of every ingredient in the pot. There’s a wealth of history behind collard greens in the American south; I urge you to dig into it if you’re interested in food and southern history. 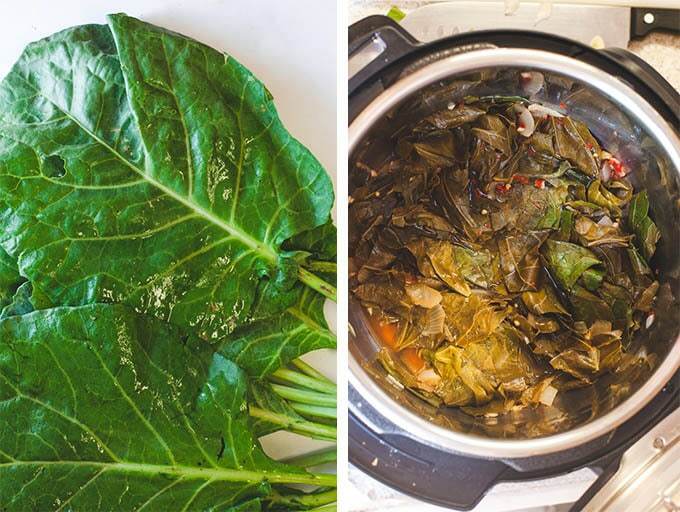 This article highlights a more recent event in history, but entire books have been written on the subject of collard greens as well. 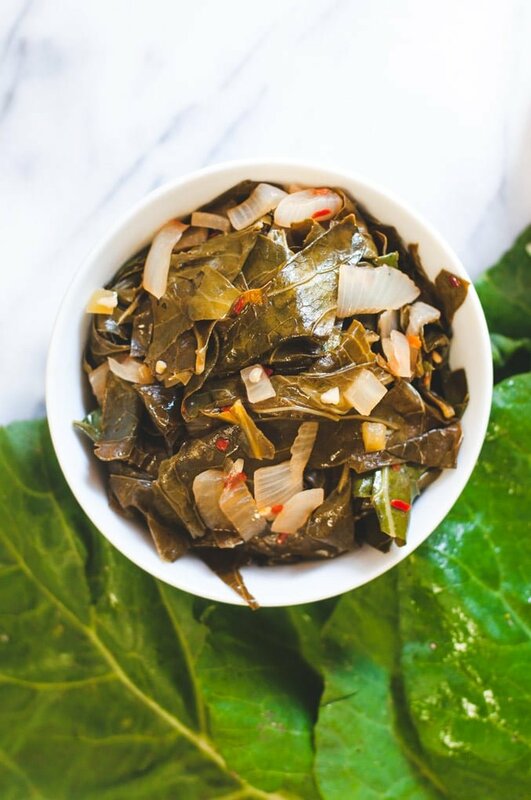 Collards are the perfect side dish for any comforting meal. Pair with mashed potatoes, breaded tofu, and a slice of jalapeno pimento cornbread and you’ve got yourself some healthy vegetarian comfort food! Looking for more vegan Southern comfort food? 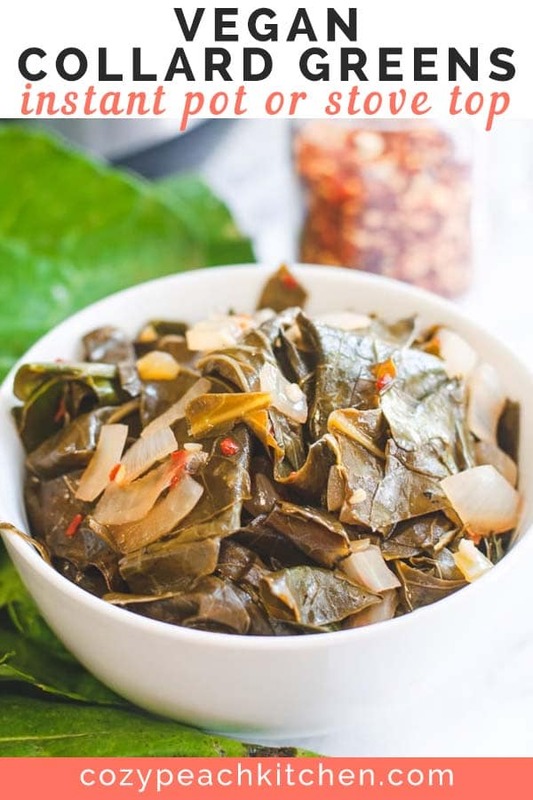 This vegan collard greens recipe uses simple savory ingredients and can be made in your pressure cooker or on the stove top. Press the "saute" function on your Instant Pot and set the heat to "normal" using the adjust key; add the oil. The Instant Pot will read "hot" when heated. Add the onion and saute for 3-4 minutes, until translucent. Add the garlic and red pepper flakes and saute for 1 more minute. Add the collards to the Instant Pot, sauteing until wilted (about 1 minute). In a medium bowl, combine the apple cider vinegar, soy sauce, vegetable broth and brown sugar. Pour into the Instant Pot. Lock the lid in place and set the valve to "sealing". Press the "pressure cook" key and adjust to "high pressure". Set the timer to 25 minutes. It will take about 10 minutes to come to pressure. When the 25 minutes (see note) are up, manually release the steam valve. Careful, it will be hot and some water may sputter out. Once the steam is released and the valve floats down you can open your Instant Pot. 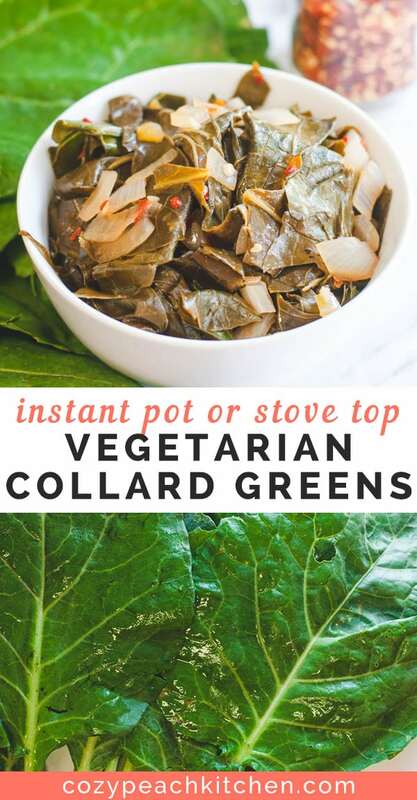 Give the collards a stir. Taste for salt, pepper, and red pepper flakes. Serve with their broth and enjoy! Heat the oil in a large pan over medium heat. Add the onion and cook until translucent, about 3-4 minutes. Add the garlic and red pepper flakes and saute 1 more minute. Add the collard greens and saute until slightly wilted, about 1 minute. In a medium bowl, mix together the remaining ingredients. Pour this liquid on the collards and bring to a simmer. Cover with a lid. Simmer until tender; add additional vegetable broth as needed. It will take 50 minutes to an hour for the collards to become tender. 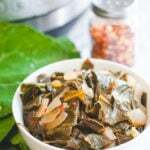 Serve collards with their broth and enjoy! For the Instant Pot: If the greens don't reach your desired tenderness replace and seal the lid and cook for 5 more minutes on high pressure. Add more time as needed. Just made these and it was amazing! Thank you so much, this will now be added to my “keep” pile of vegan instant pot recipes.